A dedicated group of volunteers has been maintaining the Roche Harbor trails for 11 years, with strong support from Roche Harbor Resort. The old logging roads and more recently built single-track paths through the woods are faithfully tended by more than a dozen neighbors. In 2015, as an example, the group logged 407 hours of trail maintenance work. Resort manager Brent Snow provides moral and financial support but as far as telling them what to do, he generally stays out of their way. “Just do it,” he has told Sue Buettell, the coordinator of the group. The area, bounded by the Roche Harbor Airport, Rouleau Road, and Roche Harbor Road, is open year-round to the public. The paths get pretty wet in the rainy season, and the group has built 22 puncheons, bridges, and raised walkways to help walkers over the muddiest spots. A couple of weeks ago several of the volunteers added 38 feet of such walkways. 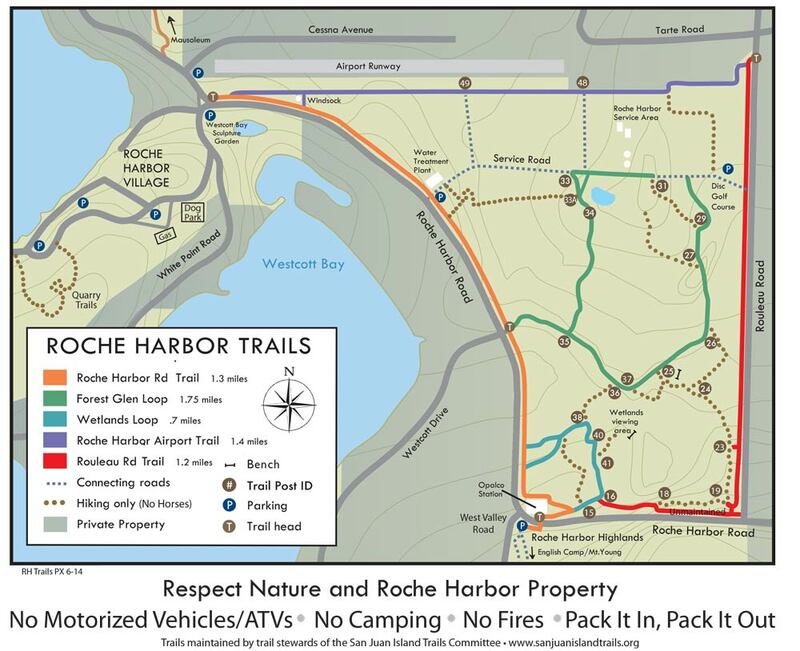 With a budget provided by Roche Harbor Resort, the group prints 4000-5000 maps every year which are given out at the hotel desk and placed in map boxes at trail heads. 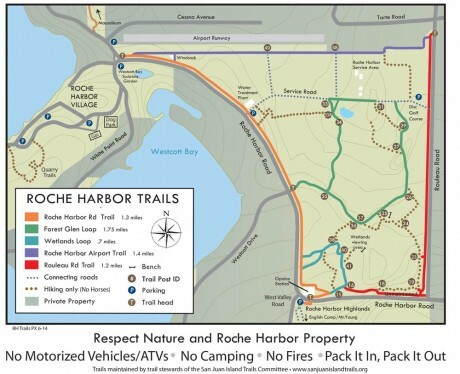 One side of the map shows the Roche trails and the other shows English Camp (which now includes the Mitchell Hill area) and the adjoining Roche Harbor Highlands property (around Briggs Lake). The budget also covers the costs of equipment such as a mower and a gas hedge cutter, trail signage, mower maintenance, gas, and general trail building supplies. Once a year the volunteers come together for dinner at McMillin’s — for their formal annual meeting. This is also a line item in their budget. Additionally, a dedicated group approached Brent a few years ago about building a dog park on the north end of the island on the resort. Permission was granted and Phil Schober, David Dehlendorf, Cal Bucholtz, Dave Ambrose, and Mike and Sue Buettell helped construct a 1-1/2-acre dog park on the hill above the resort with resort funding. Andy Reid, the trail manager, determines what major trail work needs to be done, and has also built four beautiful benches and placed them at strategic resting places along the trails. Other trail stewards include Tim Cowell, Tom and Robin Donnelly, Bill Evans, Sam and Sandy Johnston, Fred Schumacher, Mike Buettell, and Leslie and Val Veirs — most of whom have “adopted” specific trails to maintain — and mowers Dave Ambrose, Mike Buettell, David Dehlendorf, Bill Evans, and Colin Murphy. Additionally, the resort pays Scott Johansen to mow the wide path that goes alongside Roche Harbor Road, a part of the Barracks to Boats three-mile trail between the resort and the English Camp parade ground dedicated in 2009. These trail maps are also available on the Trails Committee’s website: sanjuanislandtrails.org. They can be downloaded and printed. A big THANK YOU to Roche Harbor Resort and all the volunteers. The trails are a beautiful and welcome feature for residents and visitors alike. This is a wonderful public service – thank you ALL!